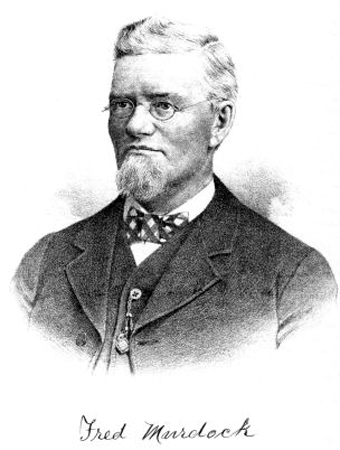 FREDERICK MURDOCK is a native of Tippecanoe County, Indiana, born in Wayne Township, December 14, 1836, the eldest son of WILLIAM T. MURDOCK, an old and honored pioneer of the county. He was reared to manhood in his native township, and in his childhood attended the district school, and later Farmers' Institute, Danville, Illinois, and Terre Haute, Indiana. He remained on the home farm until his marriage, which occurred November 7, 1861, to MISS ELIZABETH STEWART, the eldest child of WILLIAM and AMELIA (KING) STEWART. Her parents settled at Romney, in Randolph Township, this county, about the year 1843, where they made their home until the death of MR. STEWART in October, 1854, aged thirty-seven years. MRS. STEWART married again and moved to Waynetown, Montgomery County, Indiana, where she died February 4, 1872, aged over forty-eight years. MR. and MRS. STEWART were the parents of six children, all of whom are yet living, except one daughter, who died April 21, 1862, in her eleventh year. To the second marriage of MRS. STEWART were born three children. Four children have been born to MR. and MRS. MURDOCK--LILLIE BELL was born December 2, 1862, and died at Logansport, while visiting her uncle's, February 2, 1882, aged nineteen years; FLORA, born March 13, 1863, is the wife of WALTER E. DOOLITTLE, of Lafayette; WILLIAM F., born September 11, 1872, and MAUD, born October 11, 1879, are still at home. After his marriage MR. MURDOCK settled on a farm of 168 acres of land in Benton County, situated on Mudpine and on the road leading from Oxford to Parish Grove. This farm, which he received from his father, was valued at the time at $3,000. There being no railroads in the country when he settled here, and no market near for his grain, he turned his attention principally to the raising of stock, making a specialty of cattle, and in this enterprise he was quite successful, clearing $3,500 on a herd of 100 three-year-olds. Not being altogether satisfied with Benton County, he after realizing this handsome profit, determined to return to his native county, and December 6, 1865, he bought of JOSEPH N. TAYLOR, 240 acres of partially improved land on section 5, Wayne Township, to which he removed in the latter part of February, 1866, and here he has since made his home. He paid down for the same the sum of $4,000, leaving a balance unpaid of $8,600, for which he gave his notes payable in one, two, and three years at six per cent interest, with a mortgage security. He went to work here with the determination to meet every obligation against him, and by persevering industry and good management, he was enabled to do it, in the meantime, disposing of his Benton County farm at a good price. He was so successful, that he concluded to build, and in 1870 he erected a fine brick residence, which is considered the best in his township, and his farm buildings are correspondingly good. He has since this added 183 acres to his original purchase, and has now one of the best farms in his neighborhood. He takes much pride in the cultivation of his farm, and by his neighbors he is regarded as one of the most substantial agriculturists of the county. His fortune has been acquired by his prudent management and the hearty cooperation of his wife. He has rented all his lands except the farm on which he resides, to which he devotes his entire attention. He is a man of strict integrity, fair and honorable in all his dealings, and his word is considered as good as his bond. In all business transactions of importance he has made it a rule to consult with his father, and get his advice, and in so doing has gained his father's confidence. In all his many business transactions with his father he has invariably endeavored to make his word as good to him as to a stranger. He never contracts a debt unless he feels confident that he can pay it. In 1876 MR. MURDOCK visited Philadelphia, going by way of Washington City and Baltimore, and returning by New York, up the Hudson River to Albany, thence to Buffalo and Niagara Falls. In 1886 he also made a trip through Kansas, accompanied by his father and mother, who visited their sisters, MRS. WILLIAM L. BROWN, of Sterling, and MRS. CATHERIN TULLIS, of Great Bend. His parents find a pleasant home with him, where he delights in surrounding them with all the necessary comforts for their declining years. Although an active member of the Democratic party MR. MURDOCK has never sought official positions, preferring to attend to the duties of his farm. Both he and his wife are worthy members of the Methodist Episcopal church.